Do you have a One Little Word? Rather than a resolution that so often get broken before January ends, a OLW is a simple word that you focus on throughout the year- something you want to work on and improve upon, something you want to keep in mind as the year goes on. Last year, I chose the word Trust. I wanted to trust in God to use me wherever He could to do good for Him. I wanted to use my blog to reach others through my writing. I wanted to become more involved in my church in whatever way I was needed. I wanted to put my trust in Him through all of that, and know that he would put me where I was needed. That was what I had in mind... but as it turned out, that is not what 2016 had in store for me. Yes, I continued to use this platform to bring Him glory, yes I did become more involved at my church- taking over their social media account and joining the outreach team- but this was not that only way that my trust was tested throughout the year. It seems for many, 2016 was a year of great loss and hardship. In recent days with the increase of celebrity deaths, I've seen it referred to as 'The Year of the Reaper'. Unfortunately, for myself, that loss has hit much closer to home. Early this year, my husband lost his job. Aside from my limited blog income here and there, this was our main income. For over a month, we had no income whatsoever. Thankfully, my husband was able to find a new job, but despite searching for other options, the best he could find meant taking a massive pay cut--- less than half of what he was making in the military. We found ourselves stuck in contracts and bills that were based upon that previous budget, that we could not get out of despite our new, much lower budget. Throughout the year we have cut down where we could, exhausted our savings, and worked hard to improve the situation. I wish I could say that the situation has improved, but unfortunately, that's not the reality right now. And so I find myself having to trust in God, that we will find a way to get through the next month, that we will find a way to keep the power on and food on the table. I have had to trust that it WILL get better. Through all that, I found my health going downhill. I have always suffered with severe anxiety, which has increasingly gotten worse over the past few years, but this year it really took its toll. The situations we have faced would be difficult for anyone to deal with, but certainly is not made easier by this anxiety. And so my health- physical and mental- took a hit. I've struggled with migraines and issues in my hands and feet, my ears and eyes--- all of the physical symptoms that anxiety can bring. But also the mental ones, I have struggled to leave my home and found myself cutting myself off from relationships, and having daily panic attacks. In addition to the anxiety disorder that I have had for as long as I can remember, I was given the additional diagnosis of panic disorder. Once again I found myself having to trust God with my health. In September, came perhaps the biggest blow of all for me. My oldest sister was killed in a car accident. Now, I must confess, I hadn't seen my older sister in several years--- we were always missing one another when we visited. Every time, I would think to myself, we'll catch her next time. I never could have imagined there would never be one. My sister was much older than my sisters and I and we didn't grow up together (she was my father's 'daughter' from his first marriage), but I idolized her. She was the cool, much older sister and I wanted to be just like her. 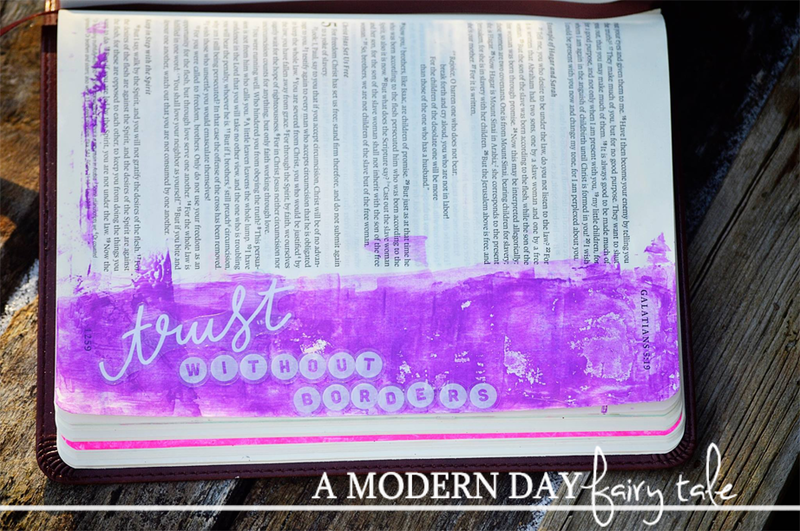 I had to trust in God's plan, because this was certainly one that I could not make sense of. As I said, 2016 has been a tough year, perhaps the worst I've experienced (though many GREAT things have come from it too, and I thank God for those blessings through the turmoil daily). It is a year that has put that little word to a huge test. When I selected that word a year ago, I was in a good place, I could not have imagined how much that word would come to mean. I kept this all in mind as I searched for the perfect word for 2017. I contemplated strength, knowing I would certainly need it in the coming months, but it just didn't seem to be the right fit. I contemplated contentment to adjust to the downsizing that we continue to try and do, but the reality is I'm generally a very content person when all of the immediate needs are met. 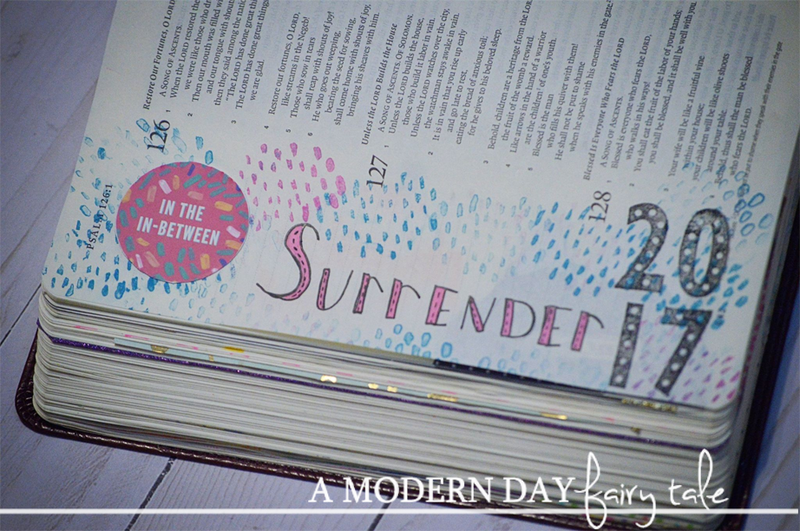 Finally, I arrived on the perfect word for me: SURRENDER. Maybe its the anxiety, but I must say, I'm a bit of a control freak. I like to know when things are going to happen and how they are going to happen. I do not handle uncertainty or doubt well. I don't like surprises. While I know deep down that God is in control of everything, actually giving it all up and handing that control over to him...well, that is the hardest thing for me. This year has certainly tested me in that respect. Suddenly, everything that had been laid out and planned so well, fell apart. I didn't and don't know how things are going to work out, I don't know how bills are to be paid, I don't know how we're going to make it through. But HE does. And so, while it may be difficult, that is my aim for the year...to let go of that control and lay it at His feet. Did you have a OLW for 2016? How did it impact your year? What word have you chosen for 2017?